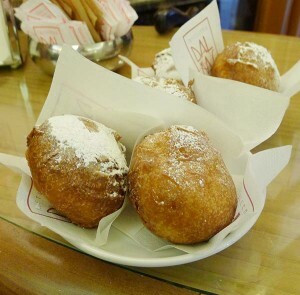 The beginning of Carnevale in Venice is hard to miss as you walk past the pastry shops around the city. The aroma of rising dough and fried deliciousness wasps down the streets. These goodies will disappear on the Wednesday after Carnevale not to return until the following year, which is probably a good thing as they are really hard to resist. And maybe knowing you have to wait a whole year makes them that much more irresistible. My all time favorite of the flavors of Carnival are the Fritelle con Crema (pictured above) and most especially the Frittelle of DalMas Pasticceria on Lista di Spagna just down from the train station and they also make a fabulous cappuccino! But every Venetian has their own favorite spot. Many times it depends on the neighborhood (sestiere) where you grew up. And just to be impartial we have tried them all, devoting entire days to tasting. They are at their absolute best when they are still steamy hot with a cup of espresso (or cappuccino). Not all pastry shops also serve drinks, but if you can combine the two? Even better. 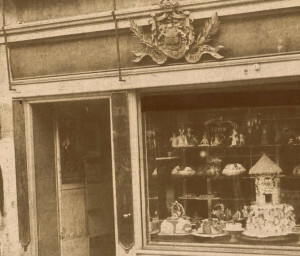 The places that all Venetian can agree as outstanding are Pasticceria Tonolo who has been making sweets since 1886 and Antonio Rosa Salva who started even earlier in 1870. Rosa Salva can be found in several locations around Venice. Salva, who was a visionary, began a thriving catering business to the wealthy Venetians in and outside of Venice, which has been carried on by his family. 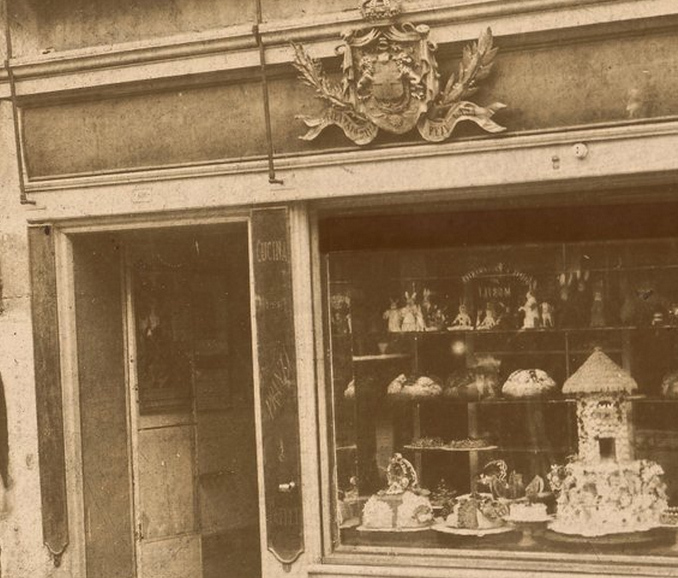 Both of these pastry shops well worth the trip and the calories you will consume there! During the days of La Serenissima (Republic of Venice), the frittelle were the exclusive domain of the “fritoleri” who had their own guild that guaranteed to them and their heirs the right of production and selling in a certain areas. This monopoly disappeared at the end of the 19th century, probably with the demise of Carnevale under the Napoleon (and Austria) era. 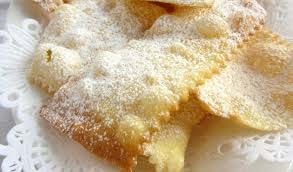 The famed Galani which is small strips of pastry dough deep fried and sprinkled liberally with powdered sugar is a popular treat. It’s origins dates back to the Romans who celebrated “Spring Festival” using the same recipe they used to make lasagna, and fried it in fat and sprinkled with sugar. The Venice Galani is much thinner and crunchy. The all time favorite of Venetians is, by comparison, more healthy, stuffed with pine nuts and raisins. (A word of caution here: If you have an allergy to pine nuts, you’d best avoid them and inquire at the bakery as to what type of oil they use in case they use Peanut Oil.). 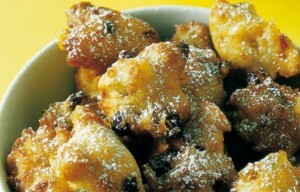 They are called Frittelle Veneziane and you can see the small bits of raisins and pine nuts. They will all disappear on Tuesday. But good news, there are many recipes online for making these yummy deserts and wouldn’t you know, there is even a box mix?